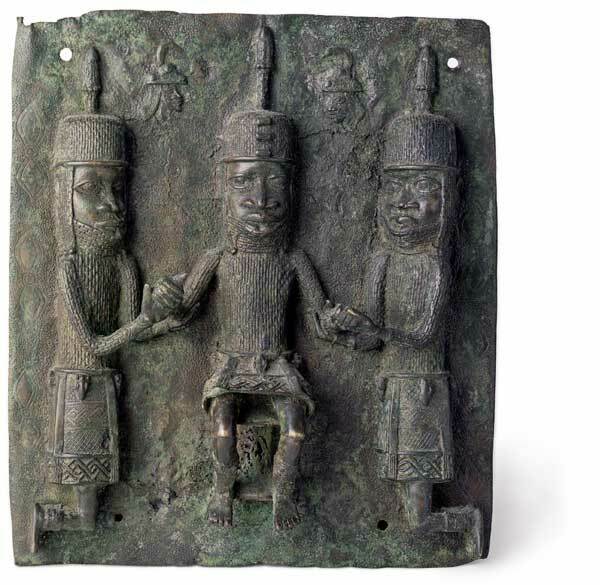 An Oba sits on his throne in the middle of this plaque, supported on either side by two kneeling aides, called enobore. According to Fagg, one of these aides is his son and heir. All three figures wear similar coral shirts and helmets as well as belts hung with animal masks. The Portuguese heads depicted on the upper part of the plaque appear often in Beninese art. For more information on the meaning of triads and hierarchical compositions, compare this plaque with the U-shaped relief plaque. Philip J. C. DARK: An introduction to Benin art and technology, Oxford 1973, Tafel S. 100. William B. FAGG: Bildwerke aus Nigeria, München 1963, S. 51. W./ B. FORMAN, Philip DARK: Die Kunst von Benin, Prag 1960, S. 39/ 40. Barbara PLANKENSTEINER (Hg. ): Benin. Könige und Rituale. Höfische Kunst aus Nigeria, Wien 2007, S. 389 - 391. Philip J. C. DARK: An introduction to Benin art and technology, Oxford 1973, Tafel 47. W./ B. FORMAN, Philip DARK: Die Kunst von Benin, Prag 1960, Tafel 30/ 31. Barbara PLANKENSTEINER (Hg. ): Benin. Könige und Rituale. Höfische Kunst aus Nigeria, Wien 2007, S. 389. William B. FAGG: Bildwerke aus Nigeria, München 1963, Tafel 21.